After hardening and tempering the two floats and the chisel it was pretty much downhill, and I ended up not taking a lot of pictures. First I re-filed the teeth on both floats, twice actually. First to remove the scale from the torch, then I jointed them, applied Dykem and filed them again. I’m not totally happy with the side float (the one with the wider teeth on the face), the teeth aren’t as even and accurate as I’d like. But it works well enough, so enough fretting over aesthetics. Next I needed to make some handles. I trued up my 3 blocks of Walnut and used my newly made 1/10″ chisel to mortise a slot for the tangs. It worked well, but as I got deeper it became more difficult to pop the chip out. Eventually I got all three done. 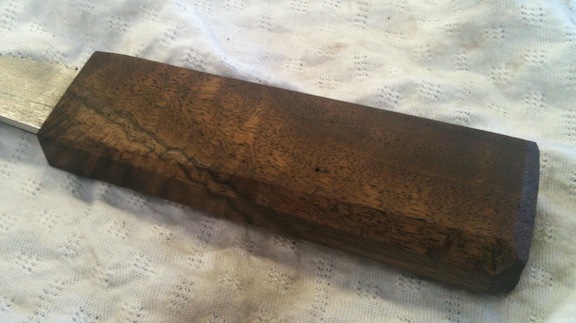 Then I did a little shaping on the handles and rubbed them with some oil. I was going for a tapered, facetted look. The handles came out reasonably well – I was shooting for functional. I want to put another coat or two of finish on the handles, then I’ll epoxy them onto the tools (they are just slightly loose on the tangs). 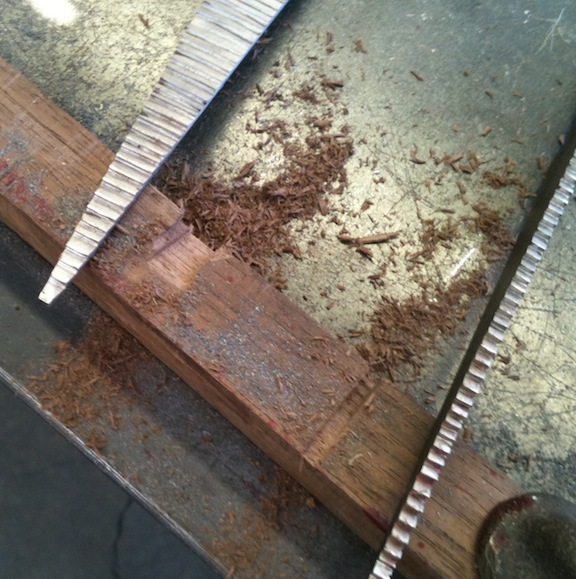 The chisel worked really well chopping a 1.5″ deep mortise that was only 1/8″ wide. 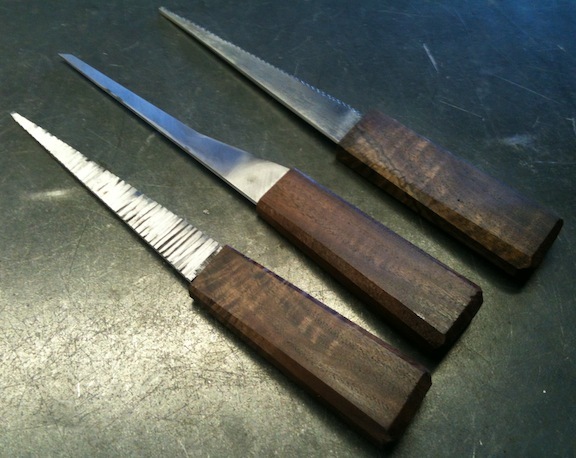 If I do this again I’ll make a chisel that is a full 1/8″ wide for chopping the mortise for the tang. And yes astute reader, that would put me one more degree away from my original interest – which was to just try sticking some molding. Which required a pair of hollow and rounds, which required a set of plane floats, which required a special chisel for the float handles. That lived in the house that Jack built. Nice! Very nice! You’re the only one I know that starts making a tool by making a tool to make the tool! Loved the video and commentary. My wife has long since given up trying to understand, although she is partial to not setting things on fire. Knowing my work habit, if you have the slightest inkling to finish a project (saw chest) I’d jump on it. At my place I’d only get back to it about a few months later. You might order/acquire the beech and let it acclimate real nice while you finish though. But in all likelihood before I can get to the saw chest I’ll work on designing a wagon vise since I haven’t heard back from Hovater about whether he can make one to fit my 5″ thick top.